Like any beloved best-selling car, the Fiat Panda has a fiercely loyal fanbase. Launched in 1980, the boxy and utilitarian Panda is a true Italian icon. Though it’s now been around for nearly 40 years, the Panda is only in its third generation. Compare that with the Volkswagen Golf, which has gone through seven iterations in the same period, and you’ll get some idea of how enduring the Panda is. So Panda owners clearly love their cars, and what better way to celebrate that than with the world’s largest gathering? We joined Panda people from across Europe in the aptly named town of Pandino, just outside Milan, to see why these cars are loved so much. Our own chariot, kindly provided by Fiat, was a new Panda Cross – rather more modern than the ’80s and ’90s cars that made up most of the gathering. 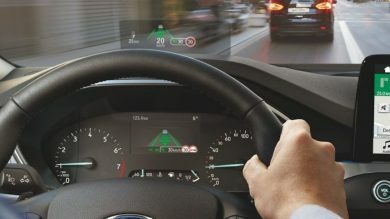 It marks a major upgrade to the Panda, which can now be fitted with a smartphone dock and connectivity to the social navigation app Waze – which Fiat says makes it ‘the most connected city car of all time’. Though this is available through Android Auto on larger cars, the Panda is the first city car in the world to have it built in – and it made short work of Milan’s roads. In a populated area, Waze is definitely the app to have. 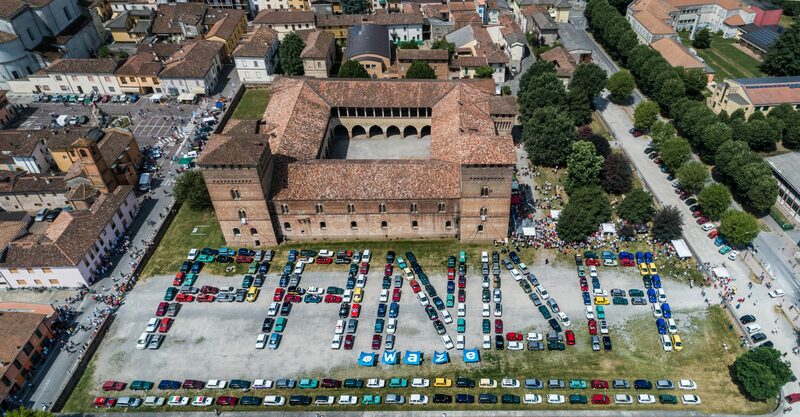 We pulled in front of the 14th-century Castello di Pandino and parked up carefully, adding to the roster of almost 400 cars – 200 of which, including ours, made up the word ‘Panda’. With the previous record of 277 soundly thrashed, we headed towards the other letters and started exploring. The majority of cars were first-generation models of all shapes and colours, with 4×4 models some of the most desirable – an unlikely marriage of the Panda’s tiny body to a surprisingly rugged and capable four-wheel-drive system. We were particularly enthralled by the Italia 90 special edition – a World Cup special with football-styled wheel covers and a wonderful interior with the mascot lovingly stitched on to each seat. The entire event was as stereotypically European as it gets. A modified Panda covered in lights sat in the middle of the second ‘A’, blasting out Eurobeat at around four billion decibels, while all around us owners and fans baked in the heat. Parked up around the side of the castle was a Panda ambulance, next to a jacked-up 4×4 with a full-sized roof tent – next door to stalls selling all kinds of Panda-related merchandise. And of course, there were droves of standard Pandas – from basic and early ‘30’ and ‘45’ models to special ‘Young’ editions and Panda vans. There were modified Pandas and concours-level Pandas, old Pandas and virtually new Pandas, though sadly no giant Pandas – nobody had seen fit to turn one into a limousine. As we strolled through the crowds, a couple of English accents broke through the chatter and we quickly accosted the owners – Ian Fearn and his partner Sue. They were part of a three-strong contingent of Brits who’d joined forces for the Panda to Pandino run. Sadly, one of the UK cars didn’t make it – stranded in the Netherlands with a faulty alternator – but the other two vehicles were present and correct: a third-generation 1.2 Easy in white and a French-registered ’95 model. It was the latter that had the most gruelling trip with Geoff Kershaw, the owner, taking it from Normandy to Stockport in Greater Manchester to collect his partner Penny before heading to Italy. Despite this 1,500-mile journey, the car – nicknamed Ginette – never missed a beat. Ginette is of course a rarity. Geoff bought her three years ago as a one-owner car, serviced from new by the same garage in northern France – and with just 70,000km on the clock. He’s since pushed that up to 90,000km, with regular trips between Normandy and his partner’s home in Stockport. The final car was the most modern – a 2015 Easy model, nicknamed Kevin and piloted by David, Tracey and George Storey, who’d set up the ‘Pandas to Pandino’ Facebook page that united the cars. Next it was time for the Panda Parade, which we’d be leading as guests of Fiat. We stepped back into our new Panda (somewhat wishing it were 30 years older, as the classic models had full-on stolen our hearts) and set off. This latest model is actually fairly close in spirit to the original – ours was fitted with a two-cylinder TwinAir engine, aping the air-cooled two-cylinder of the original, and even had four-wheel drive. Perhaps more importantly, the modern Panda is still a charming car. It’s not as refined as a Volkswagen up!, nor is it as cheap to run as a Suzuki Celerio – but with the metallic rasp of the two-cylinder engine and the adorable ‘squircle’ motif everywhere you look, it’s packed with personality. Creature comforts were of course vastly improved over the original cars. 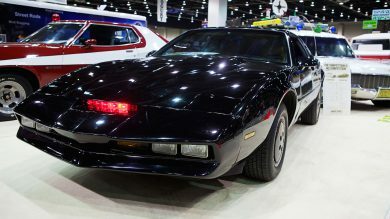 While the owners of ’80s and ’90s models baked in 30-degree heat behind us, we were cocooned in air conditioning – though of course we had to keep the windows down to wave at the crowds. Everyone we passed – even the poor drivers held up by sharply dressed Italian police so we could drive through – seemed delighted to see the Fiat convoy. 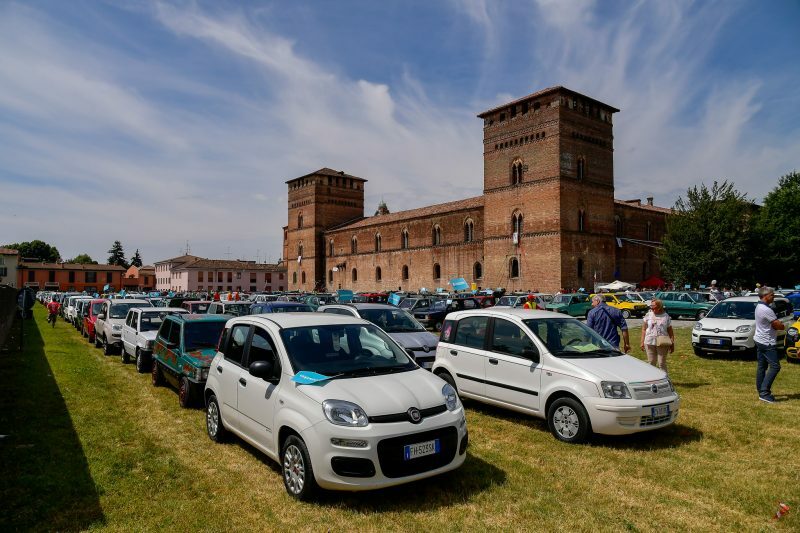 People in Italy are clearly besotted with the Panda – it’s the best-selling car in the country, the best-selling city car in Europe and has shifted 7.5 million units across its three generations. 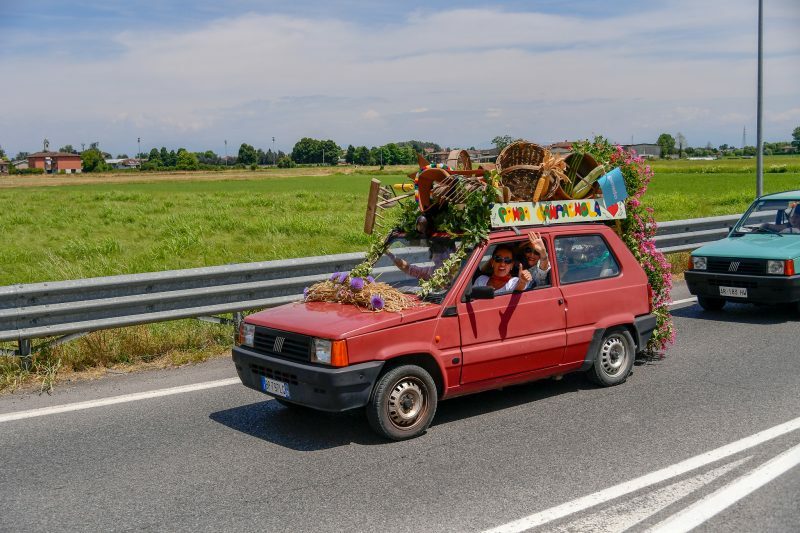 Though the addition of Waze may have connected the Panda to more than 100 million users worldwide, the Panda doesn’t need to leave Italy to be instantly connected to the hearts of 60 million Italians.